Spring has finally sprung, and that is some exciting news in my house. Warmer weather is nipping at our heals, the sun is shining longer into the day, and colorful flowers will be popping up soon. Spring does give us some beautiful gifts, but sadly, it also offers us a few gifts we'd rather not receive. You know what I'm talking about. Nasty little germs that our children seem to pick up everywhere they go. At school, the playground, and also on play dates, kids are exposed to ick's and ew's pretty much everywhere they go. Unfortunately, no matter how much we try to shield them from germs, sometimes sick happens. Springtime seems to be the worst for my kids. With the damp chilly weather at the beginning of the season, coughs, colds, sneezing and runny noses are bound to happen. Allison just started back to practicing for track last week, and it's already taking a toll on her little body. Running 4 days a week, rain or shine, has caused some throat irritation and a bit of joint discomfort. Sick Just Got Real™ in my family, but this mama is always well prepared with Pfizer Pediatric Products to help ease the pain so she can get back on the track and perform her best. • Children's Advil® provides unsurpassed fever and pain relief, and contain ibuprofen, the medicine pediatrician's use most for their own kid's fevers. Use for children ages 6 months to 11 years. 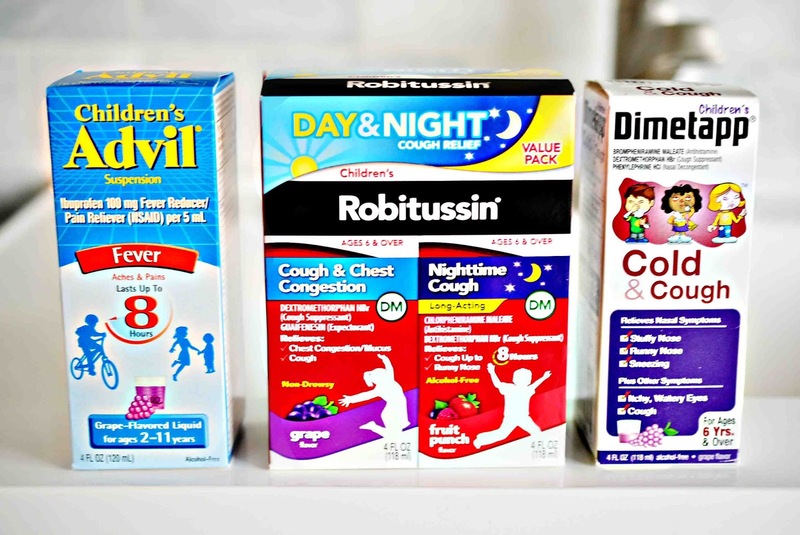 • Children's Robitussin® provides soothing action and cough control. The non-drowsy daytime formula helps break up chest congestion, while the long-acting nighttime formula relieves coughs and runny noses so children can get the rest they need. Use for children ages 6-12 years. • Children's Dimetapp® provides great tasting cold-fighting power and is the #1 pharmacist recommended brand for children's cough and cold symptoms. Use for ages 6+. On days when the weather, as well as strenuous track practices are bearing down on Allison's joints, she takes a little Children's Advil® to help alleviate some of the pain. 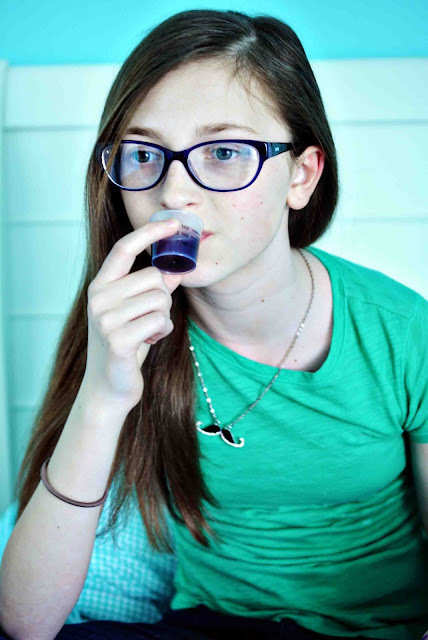 She likes the grape flavor, and I like that it is long lasting, because that means fewer doses are needed per day. If Sick Just Got Real™ in your family, you can find relief at your nearest Target store. 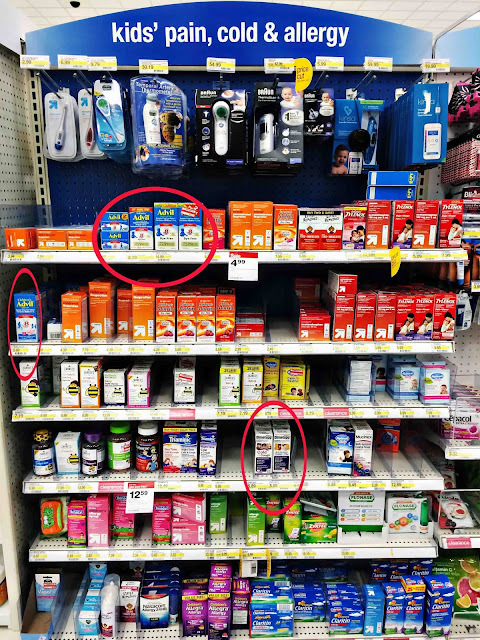 You can find Children's Advil, Children's Robitussin, and Children's Dimetapp to help get your family through cough, cold and flu season right in the kid's pain, cold & allergy aisle. *It is always important to read and keep the cartons for complete warnings and dosage information on Pfizer Pediatric Platform product and to use as directed. One lucky Theresa's Mixed Nuts reader is going to win a bundle of Pfizer Pediatric Platform of products! The giveaway is open to residents of the U.S., 18+. No P.O. boxes will be accepted. The giveaway will run through 4/13. Winner will have 48 hours to respond to winning email before a new winner is selected. All entries are verified. Please make sure you are properly completing each task you claim entries for. Failure to do so will result in your entries being removed from the giveaway form. Good luck! haven't had those in ten years or more, thankfully. Spring sure is here, ten minutes ago (it's early morning here) it was 27*C in my yard, it might go towards shocking 30*c towards noon! Utter craziness. It snowed here over the weekend. I don't know what is going on with our nutty weather! Washing hands often is the best way to keep healthy in the winter. My parents gave me Dimetap when I was a kid and that's the only brand I trust to give my own kids now that I am the mom. All of these are in my medicine cabinet at all times. When there are kids in the house, there's no shortage of yuck. If you have children, you MUST have all of these in your medicine cabinet. You can never be too prepared when you have kids. They are absolute germ incubators. This season has hit us hard as well. I'll have to check these out. My kids hate the taste of medicine and always complain when they are sick. We haven't been hot hard with sickness this year but I will check this out and have them for when they are needed. Thanks for sharing. My allergies have been driving me crazy. My son is grown so he takes the same allergy medicine as me. We always had children's Advil in the cabinet when he was little. We definitely don't want to get sick this spring. Robitussin always did the trick for me when I got a cough though. I always stock up in the winter so we are prepared for all the illness that seems to come home from school. We try to stay healthy by lots of hand washing!! I also try and get the kids to eat a balanced meal and sleep! Some days that is harder than you know! All of the products you shared are ones we always make sure to have on hand for when unexpected illness strikes. I appreciate that Robitussin has both a day and night formula. it's awful when the weather is sooooo good outside but you have to be stuck at home sick. urgh. hope everybody stays healthy and happy this season! I grind up probiotic in my coffee grinder to put in our smoothies. Then I also add powdered fiber. Yay for spring, although we had a fairly mild winter here in western Canada so I can't complain. We seemed to have our flu season here a few months ago so I am hoping it has run its course. Happy Spring Theresa!! There has been so much sickness going around this year! And it seems to be hitting later than it normally does, too. We stay stocked up on medicines for those sickies that just won't go away! My daughter is getting a cold now! I thought we were going to get lucky this year but I'm glad to know I have options to help treat her symptoms. We are just exiting a round of this at our house. The photo of the product aisle is an all to familiar sight for me! With kids still having to go to school I'm happy there are products to make them comfortable and lessen the chance of other kids catching it too. Lots of hand washing is super important for preventing those germs from being passed around. Our family has been down will illnesses the last 2 months. It has not been fun. I always have Children's Advil on hand in case the kids get sick. This has been a bad year for colds. My kids have been pretty healthy for the most part. When they do get sick, we keep several of these items on hand. Unfortunately, warmer weather doesn't always mean a break from colds or the flu for us. I always keep a stock, just in case! My kids' allergies have been going crazy this season. They cause my daughter headaches. We always keep Advil around to help her with it. She looks so much like you!! :) We keep the Dimetapp on hand, and now I'm happy to say we have the Advil too, to cut fevers! we keep them at home as well. With the dropping temperatures here in NYC, we badly need it..
We make sure to wash our hands often. Take vitamins and lots of rest. My oldest is sick right now, and my youngest just got over being sick. It's everywhere this year! I try to keep them healthy with vitamins and rest, of course handwashing, too. There's really only so much you can do. Esp. when they're in school and there's germs everywhere. My best tip is to do a lot of hand washing. I also make sure that we all get our flu shots each year. Hand washing is most important and thankfully my daughter loves eating oranges and fruits so I can get a little more vitamin c into her to help work against those germs! We make sure we have medicine on hand. we also disinfect the house and make sure we get plenty of rest and liquids !